Allergies, you can’t live with them… and would gladly live without them. Unlike standard illnesses, rather than involving a shortcoming of the immune system, allergies actually happen when it becomes too reactive. Yes, you have allergies because your immune system loves its job and is working overtime — it is called a hypersensitivity reaction. These reactions include autoimmune disorders as well as organ and graft rejections. But, here, I’ll give you the crash course on Type I hypersensitivity reactions, a.k.a allergies. To answer this question we need to go down to the cellular level and take a look at our immune system. This system consists of many parts but what we’re mostly concerned with here are white blood cells — lymphocytes and granulocytes. Our cells are well trained to respond to threats and, like with a national military, we leave it up to their discretion and expertise to determine which foreign molecules (antigens) pose a threat. T lymphocytes, our generals, make these calls. Let’s meet these high-ranking members of the army. Most of us have heard of antibodies, if only from watching cartoons. These defensive molecules are produced by our B lymphocytes — high ranking special forces who answer only to T cells. Polymorphonuclear cells (PMNs), named for their unusually shaped nuclei, are our soldiers and are the immune cells found in greatest numbers at sites of infection. They are also called granulocytes for the granules observed in their cytoplasm, which serve different functions for each cell type. Along with mast cells, these cells respond to lymphocyte orders to release granules. “Sir, yes, sir!” 3D renderings of PMNs. 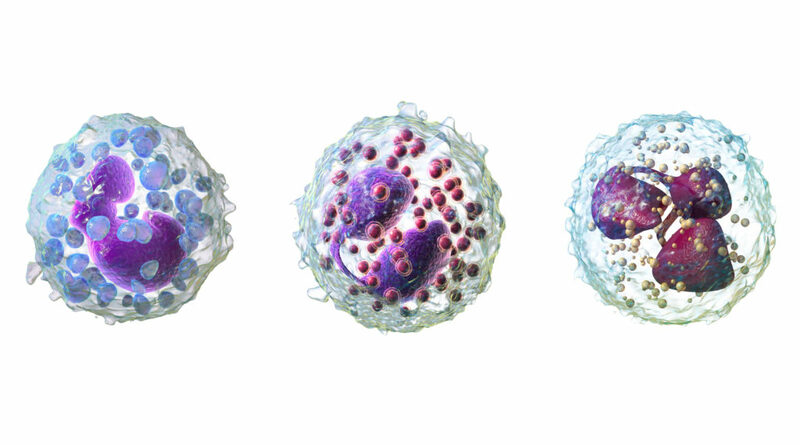 From left: a basophil, eosinophil and neutrophil. Image credits: Blausen.com staff (2014). “Medical gallery of Blausen Medical 2014”. WikiJournal of Medicine 1 (2). DOI:10.15347/wjm/2014.010. ISSN 2002-4436. Macrophages are our all-rounders – scouts, marksmen and information specialists. They are usually the first to identify strange foreign substances which they consume, break apart and then present segments (like snapshots) of them to the T cells. Now, the generals must decide if these strangers are worth waging war. T helper cells (TH, CD4+) give out orders and our cytotoxic T cells (CD8+) personally attack problem cells, like cancer cells. Sometimes, unfortunately, they get it wrong. This is when you experience a hypersensitivity reaction. Okay. So what is an allergy? With the introductions out of the way, we can learn about the anaphylactic response. ‘Ana’ means ‘away from’ and ‘phylaxis’ means ‘protection’. 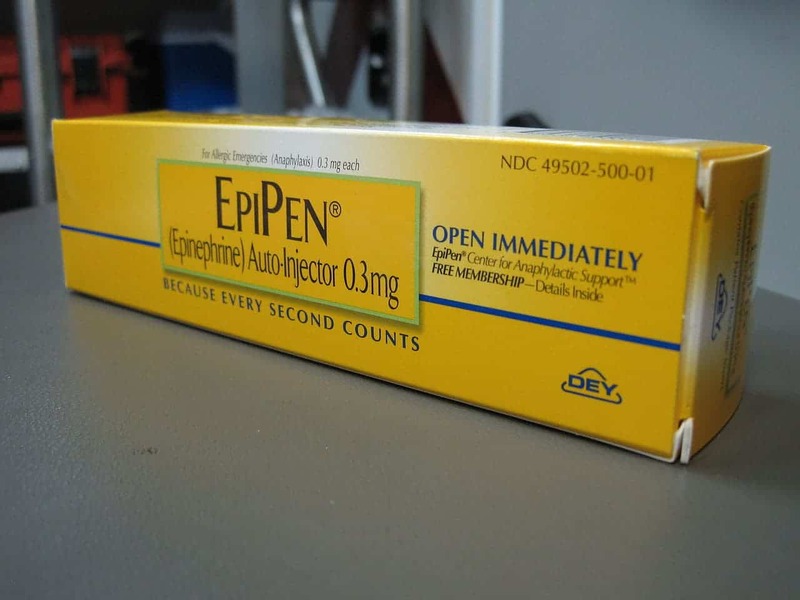 Seasonal allergies, severe allergies, and rashes are typical type I (anaphylactic) reactions. Interestingly, this is the reaction you will have, not the first time, but the second time you are exposed to the same ‘threat’ – and every time after that. Our immune system is a learning system, this is the reasoning behind vaccination and why chickenpox won’t affect you the same way twice. Once threatened, your army remembers their enemy so they can mount a faster, stronger defense the next time. 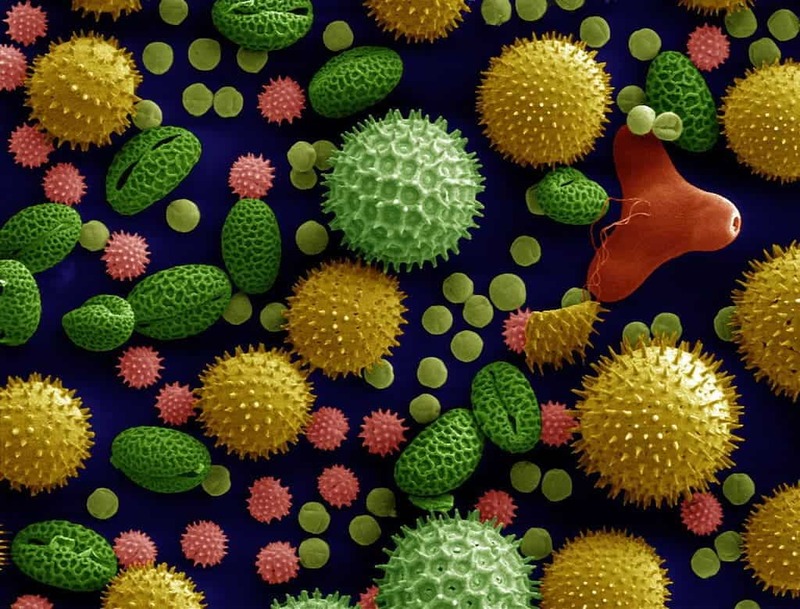 “A new challenger appears!” False color electron micrograph of various pollen grains, a common allergy trigger. Image credits: Dartmouth College Electron Microscope Facility. In our first response, our T cells send in our B cells to attack. Once activated they become bigger, scarier, plasma cells. Their weapon of choice is, of course, antibodies but particularly immunoglobulin E (IgE). The first time our body encounters a strange antigen, be it pollen, dust, animal dander etc., there is a chance we will produce IgE. Some of these attach themselves to mast cells, which behave the first time around. The second time, however, they hold nothing back. And so we get back to the anaphylactic response, characterized by vasodilation and bronchoconstriction – essentially, your blood vessels expand and your air passages close up. The T cell signals, which tell your blood vessels to expand, are to allow cells like PMNs and mast cells to move more quickly to the site of the challenge. Unfortunately, in the case of allergies this is usually your respiratory tract and skin. Once the PMNs and mast cells see their enemy, all hell breaks loose. The IgE antibodies on the mast cells identify the evil pollen and trigger the cells to degranulate, along with the attacking basophils. Diagram showing a mast cell with attached IgE (A) and its degranulation (B) once the deadly pollen grain antigen binds to it. Image credits: Zoe Gordon, ZME Science. From these granules, among other pre-formed mediators, histamines come out. A bit like grenades, they do their job very well but create a mess while they’re at it. They are excellent vasodilators and help your army enter the area quickly, unfortunately, they also make those areas leak. Essentially, histamines help to cause your red, runny nose and watery eyes. In fact, histamines are also stimulating your nerves and making you sneeze and itch. This is the reason why the medication we take to unclog our poor sinuses and de-rash our skin are antihistamines. The reaction that occurs — swelling of the area, redness, inrush of cells — is a standard inflammation reaction. And we see this on our skin in the form of itchy rashes or hives. The redness is because the blood vessels have expanded. But what about bronchoconstriction? As it turns out, within ten minutes after exposure, other mediators (e.g. prostaglandins) in those granules trigger tightening of the smooth muscle in the respiratory tract. This is allergy induced asthma and can become life-threatening anaphylaxis. The war is over, but those cells just don’t seem to want to go away. In fact, some reinforcements are still arriving. The acute symptoms are gone but the effects of their presence remains. Rashes and hives can last for weeks or even months. The bronchoconstriction is even more troublesome, usually peaking at 30 minutes and fading but sometimes recurring after a few hours. Anaphylaxis is a different situation than your standard type I reaction. It’s potentially life-threatening and often comes with some combination of these symptoms: visible inflammation, trouble breathing, a worrisome drop in blood pressure, gastrointestinal distress. When the person’s face swells up and they can’t breathe, what they need is a shot of adrenaline! The most well-known brand of portable epinephrine shots. Image credits: Intropin/ Wikimedia Commons. 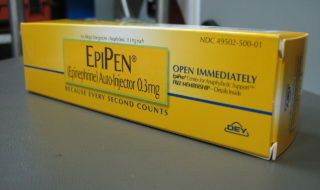 Epinephrine shots are your go-to for anaphylaxis – the sooner the better. Why? Because adrenaline essentially causes the exact opposite effect of inflammation. It’s our fight or flight hormone. It makes us breathe better, pushes up our heart rate and constricts our veins to increase blood pressure and flow. Allergies only become more severe with repeated exposure, so if you have experienced anaphylaxis, ensure you walk with your shots and that there is a way for people to know. All in all, your pollen allergy is essentially equivalent to a stray beach ball rolling across the battlefield and immediately getting focus fired by every soldier on hand – because it looked funny. And it doesn’t seem to matter how many times they try to harmlessly roll by. In fact, over time, the soldiers get joined by an extra platoon, then tanks, and then the air force because those beach balls have got to go! And over a few bits of pollen, soldiers and bystanders have been lost. Yes, it’s very strange to imagine, but a lot of the symptoms we associate with allergies and illness aren’t things that the invader is doing to your body, but things that your body is doing to you – fever, runny nose, itchy eyes, shortness of breath, rashes, and hives. Your body is making you miserable… in an attempt to protect you. But, remember, when it’s not an allergy, to appreciate that. It’s doing the best it can.